What our vocation as a married couple calls us to do, however… is to allow love to see what is really there and develop the virtue of gratitude together, to help us remember the gift of love that we were given at the beginning. Gratitude shapes our character. By developing this virtue one to another, we are able to avoid the cardinal sin of marriage: the absence of gratitude. Without gratitude, we cannot appreciate the grace of God which is always around us… and in our spouse. Examen, together as a couple… is a perfect discipline to practice. Jesuit father Dennis Hamm gives us a helpful modern version of the ancient examination of conscience which is more an examen of consciousness. He points out that in French and Spanish the word ‘conciencia‘ has a much larger meaning than the English word ‘conscience’. Consciousness is about awareness, self-knowledge, and feelings. The practice consists in prayer at the end of the day, reviewing high points and low points and being conscious of one’s feelings in relation to the daily activities, challenges and questions. Feelings will rise up and Fr. Hamm assures us that feelings are genuine clues about what is really going on in our interior lives. The method is easily adapted to illuminating the marriage relationship. At the end of the day, find a quiet place for a few moments of prayer, and begin by praying for light to see and understand how you regard your spouse. A simple prayer is all that is needed, followed by a review of the day with the emphasis being on thanksgiving. This is not a search for what is wrong, but for seeing more clearly what is right. One might ask the question, in the spirit of prayer, how the presence of one’s spouse is a source of blessing. What unique qualities of your spouse rise up in your consciousness? As in all prayer, it is essential to be honest with each other, and of course, with God. Don’t make things up. You are concentrating on each person’s reality. Over time it is possible that annoying behaviors will be seen more as quirks. The examen can and should include the relationship itself. How is life richer and more meaningful because you and your spouse are given to each other? 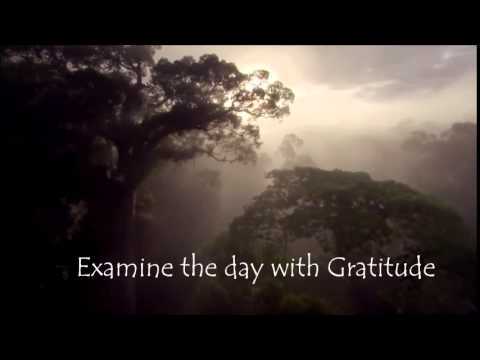 If a daily examen seems impossible, then a weekly exercise can still be beneficial. The point is to bring to consciousness the essence of the other person, oneself, and the marital relationship and to express genuine gratitude for all of that. Because Ignatian prayer usually moves toward action, it seems reasonable to find ways to express this gratitude to each other. Gratitude leads to many other “virtues” like laughter and fun, compassion and mercy. In addition to highlighting the gifts of our marriage partner, the examen will also uncover our propensity to magnify small failings, our own and others. When the wife of the Rev. Martin Luther King Sr. was shot while she was playing the organ in Ebenezer Baptist Church during a Sunday service, Rev. King turned to his congregation and asked everyone to kneel and thank God for all that had been left to them. How could this be? He had lost his son to assassination and now his wife. How could he say such a thing? Because during the course of his life, loving his wife and his children, loving the people he served as pastor, he was falling ever more in love with God. He knew that God was still with them; nothing was lacking. The effect of practicing gratitude in marriage has the effect of shifting our perspective, enlarging our horizons, and deepening our love, not only for our spouse but for the wider community.